Let us beware of the pendulum swinging back too far. Attempting to standardize pain assessments and treating patients solely based on a pain score has contributed to the current opioid issue. Many doctors yielded to this approach due to Joint Commission pressure and fears of low HCAHPS scores. Let’s not fall into the same trap due to fears of being singled out for “over” prescribing. An individualized approach is required. 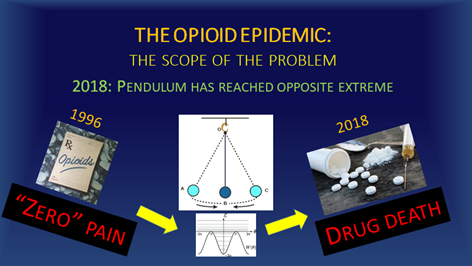 Like Dr. Ilahi, talk with your patient, make a personalized decision based on that discussion, and use the least amount of opioid possible for the shortest period of time, but do so without withholding in those circumstances when something stronger is required.